Something weird is going on with those JFK assassination records. But what? 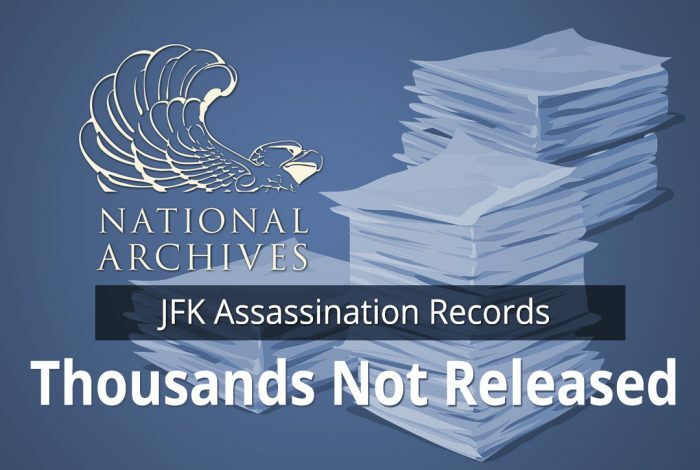 The National Archives and Records Administration (NARA) has revealed that there are thousands of still-unreleased government files related to the assassination of President John F. Kennedy. Back in December, NARA claimed that only 86 files had yet to be made public. NARA released approximately 35,000 files to the public in 2017 in a series of six batches, with the last occuring on December 15. But the process was unaccountably messy. According to the JFK Records Release Act, passed by Congress and signed into law by George H.W. Bush in 1992, all still-classified documents related to the assassination of JFK were to be made public in full by October 26, 2017 — unless the president personally decided that certain documents posed such a risk to national security that their continued suppression outweighed the public good of disclosure. There was great anticipation leading up to the deadline — researchers and enthusiasts had been waiting 25 years to see these documents. NARA helped pump up the excitement with an early release of a small batch of documents in July. And President Donald Trump seemed to allay fears that he might succumb to pressure from the intelligence community to withhold documents; a series of presidential tweets appeared to indicate that the scheduled release was on track. Come the day of the deadline, the White House explained that the various agencies needed time — six months’ worth — to “re-review” all of the records to make sure that national security was not at risk. Over the course of the next several months, NARA began releasing batches of files. But the releases were a mixture — some of the files were completely unredacted, some were partially redacted, and some were almost completely redacted. The various agencies involved — CIA, FBI, State Department, and others — were given until April 26, 2018, to determine how much of the redacted material would need to remain so. But now there’s been an additional wrinkle. We conducted a search and were able to locate an EXCEL spreadsheet that lists everything that has not been released since December 15th, 2017 (the last release date). We are releasing this document [in] full with no redactions. The spreadsheet lists the JFK record number, the decision, the file number, document date, number of pages, and the origination agency. The list contains 22,933 record numbers. When comparing it to NARA’s master spreadsheet of 2017 releases, it appears that the majority of files on the FOIA list were already made public last year. So “not been released” includes all of the many files that were in fact released in 2017, but with redactions, and are now awaiting the final review deadline in April. Curiously however, there are 2,901 files listed that are not on NARA’s spreadsheet. That’s certainly a much larger number than the 86 files NARA mentioned in December. WhoWhatWhy has created a spreadsheet detailing these files. A portion of the files appear not to have been publicly released, while curiously many of the files were released in redacted form in the 90s, yet not as part of the 2017 release. Seeking clarification, WhoWhatWhy reached out to NARA’s Office of General Counsel and spoke with a FOIA representative who confirmed that the files labeled “Withheld” — nearly 800 in the FOIA list — had indeed not yet been made public. Subsequently a representative from the public relations office clarified that, while they couldn’t confirm the files not on the master spreadsheet, some files were not legally subject to the records release, and thus were not included in the master spreadsheet. This would make sense, as the JFK Records Act does specify certain exemptions — specifically files falling under section 6103 of the IRS code, sealed grand jury records, and records governed by deeds of gifts or donations to the government. Unfortunately, the FOIA list does not include any title or subject information. However, from the 795 labeled “withheld,” roughly 40 percent originate from the IRS. That these files might fall under the IRS code could help explain the discrepancy. But why the other “withheld” files and the approximately 2,100 files labeled “redacted” don’t appear on the NARA master list is not yet clear. Further compounding the confusion is an additional FOIA NARA document of “withheld” files that was released back in 2016. WhoWhatWhy covered this story and some of the interesting files contained in the document. While most of the documents on this list have been released (albeit some in redacted form) as part of the 2017 releases, there appear to be files that overlap with the 2018 list of 2,901, as well as 375 docs unique to this list that are also not on the NARA master list. WhoWhatWhy has created a file highlighting these records — orange for files overlapping with the 2018 list, and green for files unique to the 2016 list. The first page of this 2016 list reveal some interesting files that appear to have not yet been released: audio tape interviews from the 1970s Rockefeller Commission hearings with CIA agents William “Bill” Harvey, Frank Sturgis, and Sheffield Edwards — persons of great interest to JFK assassination researchers. What could be the reason for these files being withheld? Comparing both the 2018 and 2016 lists, there appear to be approximately 3,275 files not included in the 2017 NARA releases. The reasons why many of these files have not yet been released could very well prove innocuous. Perhaps it was human error, or they fall outside of the legal scope as mentioned earlier, or perhaps there are duplicates. But from just a cursory review of some of these missing files, there appear to be many documents and audio recordings that are of great public interest, and it is not clear why they were not released. “Hundreds of withheld-in-full documents targeted for release in a 2016 NARA listing remain withheld, and have magically vanished from a 2018 NARA listing. Hundreds of other documents which have been released do not even appear in NARA’s online database, which we now discover is not a definitive source. And much more. It is getting harder to imagine that when the dust settles there will in fact be an authoritative accounting of documents that already seem to be falling through the cracks,” says Bradford. Why were these additional files not previously brought to the attention of the public? Have these files been “re-reviewed” by the originating agencies? What is the explanation for these discrepancies? Stay tuned as we bring you more on this story. Correction notice 4/13/2018, 12:45 pm: The wording was changed in several instances to clarify/emphasize that only some — not a majority — of the missing files from the 2017 NARA releases were never released to the public. Many were previously released with redactions, but not released online as part of the 2017 NARA releases.